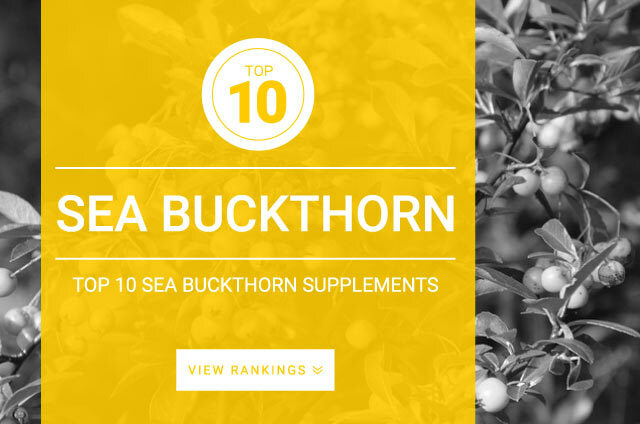 Sea buckthorn is a plant native to most parts of China, Russia, and Canada. The berries of this plant or its oils are extracted and used medicinally. Sea buckthorn (Hippophae rhamnoides L.) has grown in popularity for its medicinal and nutritional potential as it contains many health boosting flavonoids, vitamins, omega-3s, omega-6, omega-7, and omega-9 fatty acids. All parts of the Sea buckthorn plant are considered to be a good source bioactive substances including vitamin-A, vitamin-C, vitamin-E, vitamin-K, riboflavin, folic acid, carotenoids, malic acid, oxalic acid, polyunsaturated fatty acids, and several amino acids. In Traditional Chinese Medicine Sea buckthorn is used for the treatment of asthma, skin diseases, ulcers, and lung disorders. Research shows that supplementation of sea buckthorn has a wide spectrum of pharmacological effects including antioxidant, anti-atherogenic, anti-stress, cognitive function, radio-protective, tissue repair, and immune system support. Sea buckthorn is commonly consumed as a food in many places around the world, supplementation is presumed to be generally safe. Standard daily dose of Sea Buckthorn : 500 mg – 2,000 mg of per day.